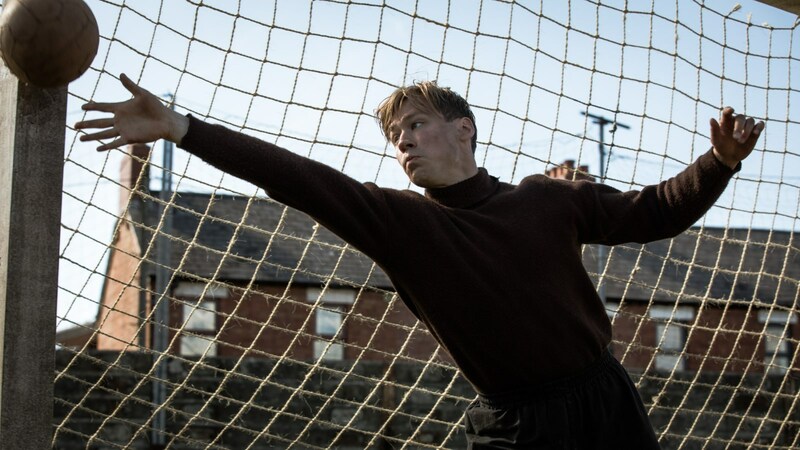 Though The Keeper faithfully retells the life of Bert Trautmann, the legendary Manchester City goalkeeper through the 1940s and 50s, director Marcus H. Rosenmüller’s (Grave Decisions) film does not have the feel of a traditional biopic. Instead the nostalgic, soft-focus camera work of Daniel Gottschalk and the lightness of tone create a work that has more in common with an episode of Foyle’s War and other BBC wartime domestic dramas. Trautmann is remembered now as one of the best goalkeepers in the history of football and is probably most famous for continuing to play in the FA cup final in 1956 in spite of having broken his neck in an awkward tackle. When we first meet him here, however, he is a frightened German soldier struggling to survive amid the chaos of the Second World War. Captured in an attack which sees most of his companions killed, he is brought to England and interned in a prisoner of war camp near Liverpool. Here he runs foul of the camp commander (Harry Melling) but is saved from the latrine duties he is assigned to when his footballing skills are spotted by Jack Friar (John Henshaw), club secretary of the local team, St. Helen’s Town. Friar organises day release from the camp and Trautmann comes to help him in his grocery shop, which also gives him time to train with the football team. When he meets Friar’s daughter, Margaret (Freya Mavor), he is immediately attracted to her and over time a romantic relationship develops. When the war ends he decides to stay on in England and is eventually head-hunted by a talent scout for Manchester City, leading to personal success but also great controversy, having a German ex-soldier on a British team so soon after the end of the war. German actor David Kross is excellent in the role of Trautmann, a young man caught up in a war he does not understand, fighting for a cause in which he has lost faith and finally carried along by the political frenzy of the times – a situation in which so many young men, today as then, find themselves. That not only fighting men suffer, but also the women who wait and work at home is pointed out by Margaret who, though she may not have suffered in the acute way he did, was deprived of the carefree life that a girl of her age should have been able to enjoy, by the daily grind of rationing, bombing and the general disruption of life. Rosenmüller’s use of archive footage of the highlights of his Trautmann’s later sporting career means that the film is not merely a romanticised biography of a footballer abut one that will appeal equally to non-football lovers who appreciate a well-told human interest story. Freya Mavor’s strong performance and Henshaw’s as her wheeler-dealer dad add a general appeal and they have some genuinely comic moments. Less successful are the caricatured portrayals of the camp commander and of Margaret’s boyfriend (Michael Socha) though the fault here lies in the writing rather than in the performances. The murdered Jewish child who haunts Trautmann is shocking when first introduced but the device is overused and becomes an irritation. The Keeper may not be a great film but it is an enjoyable one and always holds our interest.